Workers would be able to buy their companies if they are up for sale or facing closure under Labour proposals, with party research suggesting employee-owned firms make more money. ScotRail is looking to recruit fully-qualified train drivers. The number of jobs advertised in Edinburgh has surged 80% in two years, according to new analysis. A recruitment and skills fair is set to take place in the north-east this week. The chief executive of Special Olympics Great Britain has said she hopes the 2019 World Games will leave a lasting impression on employment practices in the UK for the intellectually disabled. 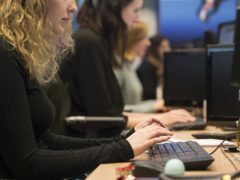 More than two-thirds of employers in Britain have yet to publish their latest gender pay gap figures – with around a fortnight to go until the deadlines. One in three breastfeeding mothers have been forced to use a toilet when they express milk after they return to work, according to a survey. The number of non-EU nationals working in the UK has jumped by more than 100,000 to a record high, official figures have revealed. An Aberdeen bus firm is holding a recruitment event to celebrate national woman’s day. Fewer than half of all Scots who witnessed sexual harassment at work stepped into to help, a new survey has revealed. More than 200 employees at Aberdeen City Council took voluntary severance or early retirement since the launch of a new scheme, new figures have shown. Council tax could also rise by 4.79% for residents across the region, with the council leader confirming discussions were still ongoing on whether to put this forward. A woman’s account of an “abusive” interview at a UK tech company has sparked outrage online as the latest example of workplace bullying. Dozens of trainee telecoms engineers are to be hired in the north-east, it was announced today. A Scottish Government campaign is hoping to make looking for a new job child’s play. Businesses are being invited to promote their vacancies for free at a leading recruitment event. More than 90 Aberdeen staff were told on Wednesday they were being made redundant with the move by the investment firm rescuing the remaining 96. More than 300 jobs have been saved at an Aberdeen-based energy services firm. An Aberdeen recruitment agency has won a prestigious gong for its annual youth art contest. Around 1,400 jobs in oil and gas based in Aberdeen are expected to be lost in the next three years, according to a new report. A programme which has helped hundreds of people in Aberdeen secure a job could be extended for another four years. A looming skills shortage in the north-east oil and gas sector has been highlighted in the latest industry survey from the Aberdeen and Grampian Chamber of Commerce (AGCC). The number of people looking for work in Aberdeen has fallen by 9% compared with last year, new figures suggest. A north-east oil and gas careers advice event is to take place next month. Unite workers on three North Sea platforms have accepted a pay deal, bringing an end to a protracted strike dispute.